Our quality control procedures ensure safety, product integrity, and consistency. The work of our quality control staff begins long before the coffee reaches the Paul deLima facilities in central New York. A small test batch of beans is sent from origin to the Paul deLima facilities and is analyzed by our expert staff of ‘cuppers’. The beans are tested for fragrance, acidity, flavor, body, aftertaste, and balance, and are graded on a scale of one to ten. Those tests are repeated when the ‘lot’ of coffee arrives at each leg of its journey to confirm that the beans were not altered in any way. During the roasting process, coffees are sampled from the roaster/cooler to ensure that their roast profiles match those generated during development. These can range from the roast color (where it is on the spectrum of light to dark) to the moisture content post–roast. If a ground product, the grind will be tested using laser diffraction to ensure the grind particle size distribution analysis matches the profile. Cupping is the sensory evaluation of brewed coffee, a quality control procedure used to ensure that the finished product matches the characteristics of the coffee at origin, bringing you a consistent, authentic taste. Every product is cupped once packed by a highly attuned sensory panel of experts. Being a cupper requires training, testing, and constant evaluation to be able to scientifically quantify tastes and textures. We primarily use the cupping technique for two main purposes: to approve of the green coffee we are purchasing, and ensure that the coffee we produce meets our high standards. 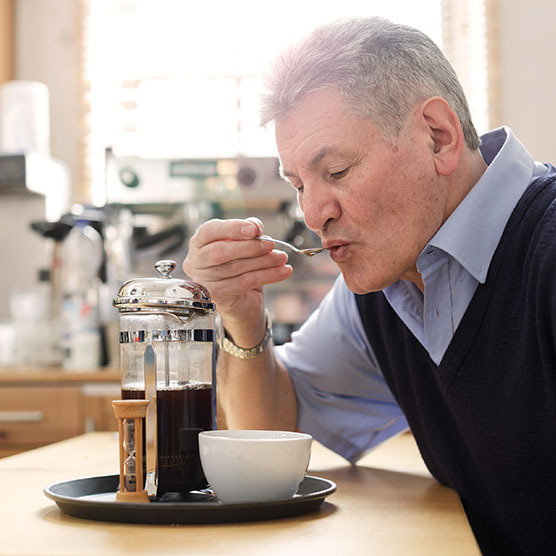 Aromatic perception of gases released from brewed coffee. Corporeal gustatory perception of hydrogen ions in brew, an actual sensation of the tongue, ranked by intensity. Combination of Aroma and Taste with the modulation of basic taste profiles (sweet, sour, bitter, salty…). The sensory perception of mouth feel from the fats, oils, and sediments. Perceived flavor sensations that remain or emerge after the coffee has been swallowed or spit. The preference of the evaluator or overall liking (ranked -5 to +5).